The images ideally should be gray scale. This is best done with tiffsplit.exe myimage.tif -g. PhotoShop can also convert color images into grayscale but does not use the full intensity range. This gives a picket fence profile in the intensity distribution histogram (i.e. there is a loss of intensity resolution). It is best to convert images into grayscale using tiffsplit Myimage.tif -g.
Can also convert to grayscale in PhotoShop by clicking on the title bar of the open image and using 'Image -> Mode -> Grayscale' with the mouse. Select the source (donor) image by clicking on the title bar and paste it to the clip board by pressing '^A' (control-A, select all) then '^C' (control-C, copy to clip board) on the keyboard. Select the image to be overlayed (recipient) by clicking on the title bar and convert it to an RBG color image by clicking on 'Image -> Mode -> RGBcolor' with the mouse. Open the channel box in Photoshop, if necessary, by clicking on 'Window -> Show Channels' (if it reads 'Hide Channels' then the box is already on display on the screen). Choose the color channel into which the source (donor) image is the be placed by clicking on the desired color bar (red, green or blue, see to the left). 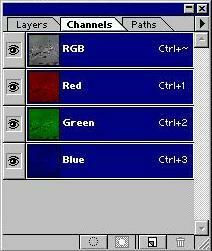 Only the selected color channel will be highlighted in blue (see box on the right). Paste the source image (donor) by pressing '^V' (control-V, paste from clip board). The green channel should now display the donor image. One may click on 'Channels' in the Channel box to see the entire image. The recipient image should appear purple and the dononr channel should be green in this example. The recipient image can be made red by erasing the blue channel to black. Select the blue channel and press '^A' (control-A, select all). Make sure that the background color in the PhotoShop tools box is true black (double click on the black square, opens color picker) then press 'delete' in order to make the blue field black. 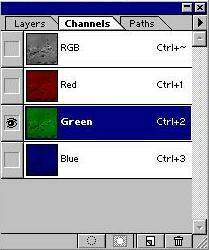 Now clicking on the RGB bar of the PhotoShop 'channels' box will show the donor image in green and the recipient image in red. The overlayed image may now be saved.